It is a problem (called the tragedy of the commons) that is faced repeatedly by individuals, social groups, business firms and nations. The problem is exacerbated by a belief prevalent among politicians and economists that competition will drive a society forward to the most favourable and profitable equilibrium. This belief is simply wrong, for reasons that I go into in the book. But what else can we do? Scientists such as Yaneer Bar-Yam from the New England Complex Systems Institute are now arguing that we need to restructure the whole way that we make decisions (check out his Twitter feed @Yaneerbaryam for details and references). I agree, especially with his analysis of the necessity for cascading decision processes. It has now been discovered by psychologists Nicole Carver and Damian Kelly-Stephen from Grinnell College in Iowa that honeybees use just this sort of strategy (Physical Review E, in press). 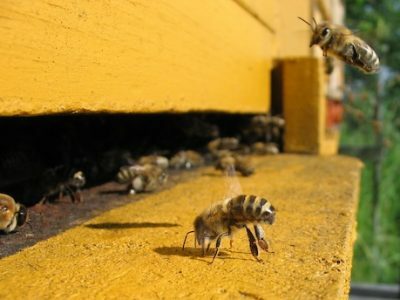 The scientists labeled individual bees with radio tags and “time-stamped” each individual’s entrances to and exits from the hive. They found that, mathematically speaking, the system could be described as “multifractal”. This analysis suggests that decision-making in the colony proceeds by a cascade of information transfer. It would be fascinating to see the same sort of analysis applied to human decision making. Perhaps it has been – the field is moving so fast that a non-expert such as myself finds it hard to keep up. But it is worth trying to keep up, because learning how to make the best decisions in our increasingly complex, interconnected world is vital for our future. Maybe cascaded, cooperative decision-making is at least part of the answer. If the honeybees can do it, why can’t we?